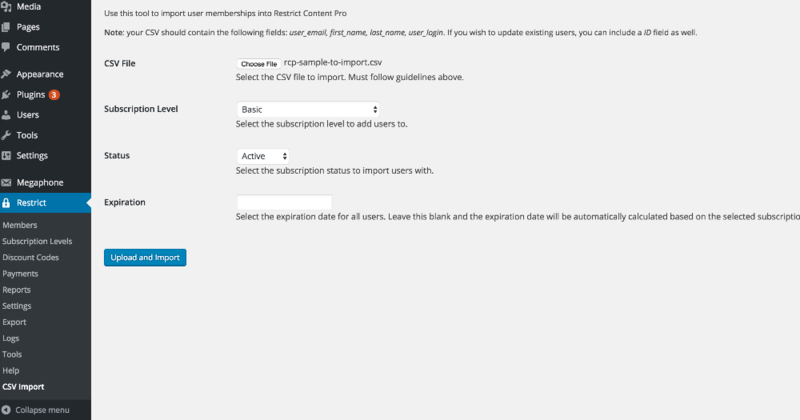 The CSV User Import add-on for Restrict Content Pro enables you to import users into your WordPress site and automatically assign them a membership. To import your users, you must first have a properly-formatted CSV file. The plugin comes with a sample.csv file to help you get started. Alternatively, you can download the sample file here. Your CSV file should contain the following fields: User Email, First Name, Last Name, and User Login. If you want to update existing users, you can include a User ID field as well. Optionally, you can import a member's payment profile ID, expiration date, subscription key, recurring status, and user password. The User Email field is the only required field, though we recommend using as many fields as possible so you can better personalize the customer experience. Note, if you leave the User Login field blank, the email address will be used for the login name. Payment Profile ID - the member's payment profile ID from the payment gateway. For Stripe, this ID has a prefix of cus_. For PayPal this ID has a prefix of I-. That's the letter I (comes after H) and a dash. For Authorize.net this ID has a prefix of anet_. Subscription ID - the ID of the subscription itself at the gateway. Not required for all gateways. For Stripe, this ID has a prefix of sub_ . Please note: the names of your column headers must match the field names above. The order the columns appear in does not matter, as long as the headers are correct. Also, you cannot have empty columns in your CSV file. Delete any columns that do not have headers before saving your CSV file. Below is a screenshot of a properly-formatted CSV import file. Once you have your import file set up, follow these steps to import your users. Select your CSV file using the Choose File button. In the Subscription Level dropdown, select the subscription level you want the users to have. In the Status option, select the subscription status you want the users to have. Options are Active, Pending, Cancelled, Expired, and Free. In the Expiration field, select the subscription expiration date you want the users to have. Leave it blank if you have an expiration column in your CSV or if you want RCP to automatically calculate the expiration date based on the subscription level duration. Click the Upload and Import button to start the import. Once the import is complete, you will see a notice that says All users have been imported. You can confirm the import by going to Users > All Users. You can confirm their membership status in the Subscription column on the All Users screen, or you can go to Restrict > Members and confirm it there. Note: when new users are imported, their passwords are automatically generated, unless you specify the user's password in the user_password column of your CSV. Each user will need to go through the Lost Password process to reset their passwords if you do not supply their passwords. Passwords for existing users will not be changed.